What Are the Signs of Fear in Dogs? Can you tell if a dog is afraid? Knowing the signs and symptoms of a fearful dog can help you address his fears and phobias before they escalate. They can also help you avoid a dog bite or attack. Familiarize yourself with the signs of fear in dogs so you can pick up on the slightest hint that a dog is anxious and stressed about something in his environment. There remains some disagreement among animal professionals about the best way to treat fear in dogs. This symptom, incidentally, is often the most difficult problem to treat when rehabilitating (and giving a home to) shelter animals, many of whom have been physically abused. 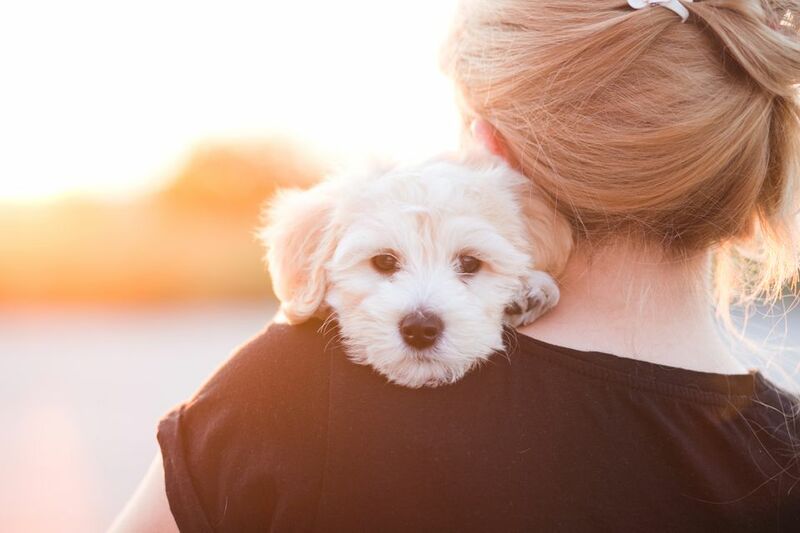 Some mildly fearful dogs may be treated by loving owners without professional help. In these cases, one must be patient and have an understanding of the dog's reality. Sometimes it's difficult to keep in mind that a dog who runs away from a welcoming owner is genuinely afraid. One widely agreed-upon strategy is to give such a dog as much space as you can. Distracting the dog with obedience commands sometimes works. Valuable treats are usually helpful. It is rarely successful to punish a dog who has committed some act of aggression or engaged in destructive behavior. In a sense, a fearful dog expects to be punished. That may be one reason why the dog is fearful. This is the connection you need to break without punishment. Greatly fearful dogs probably require professional help. Good obedience training schools for dogs go far beyond obedience issues and are better qualified than even the most loving owner to retrain a greatly fearful dog. In many cases, the outcome will be an improvement, not total rehabilitation. Look for a skilled dog trainer or behaviorist with excellent recommendations. Many dog owners resist the use of medications to treat fear in dogs. However, dog professionals and veterinarians know that certain dogs are unable to respond to behavioral approaches alone. For these dogs, appropriate medications to reduce anxiety can be helpful. It is believed that an animal in a high state of fear or anxiety is unable to learn new things. Medication alone is not a solution. However, it may be the best way to reduce your dog's anxiety and fear to a point where behavioral approaches can work. If you feel your dog is frequently in a state of extreme fear and anxiety, talk to your veterinarian about your concerns. Your vet may prescribe medication and provide you with resources for training and behavior modification. Your vet may also refer you to a veterinary behaviorist, and applied animal behaviorist, or a skilled dog trainer. It's important that you understand it will take time to help your dog conquer his fears. Be patient yet consistent. Stay in contact with the professionals who have helped you. Follow the instructions provided by professionals and see each method through. If something is not working, there may be an alternative method for managing your dog's fears. Should You Use Aversives in Dog Training?